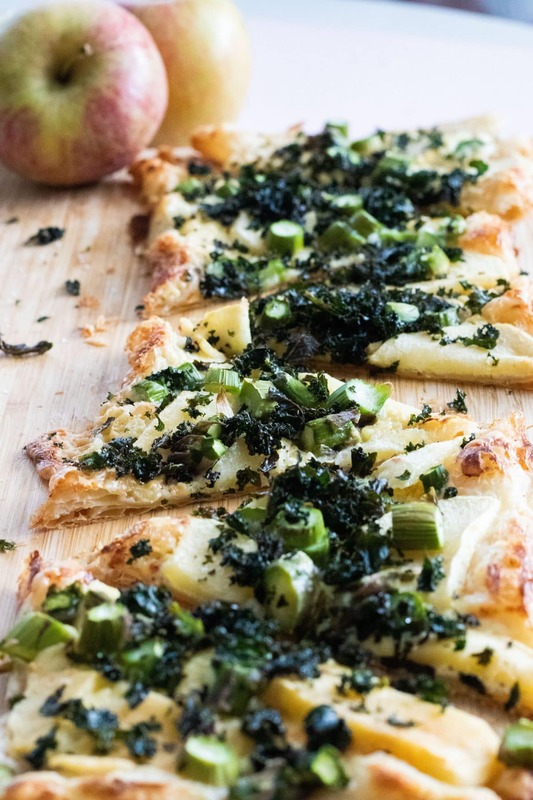 Puff Pastry Pizza is an easy & delicious way to make pizza – here it’s deliciously salty, savory & subtly sweet, topped with a mild blue cheese, sliced red apples, green asparagus and crumbled up kale chips. Perfect as an indulgent dinner for two, an appetizer or as part of a buffet or tapas spread! 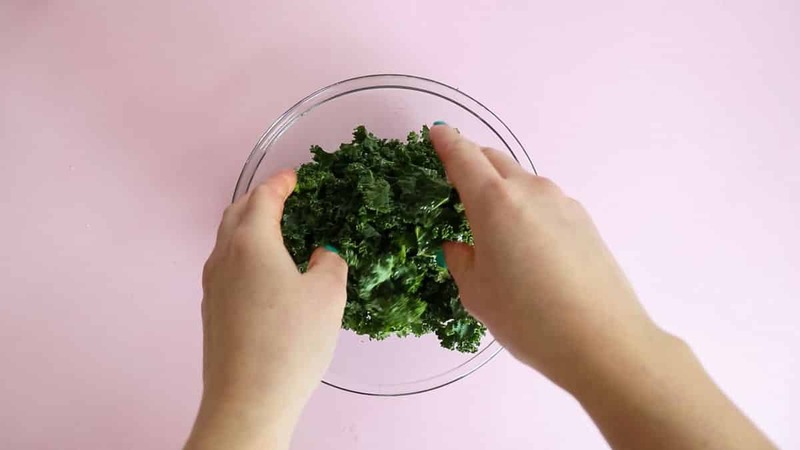 Start by separating your kale into smaller pieces, making sure to remove the hard stem. You can use the chopped & bagged kale for this, just make sure to check for pieces of stem and remove them. 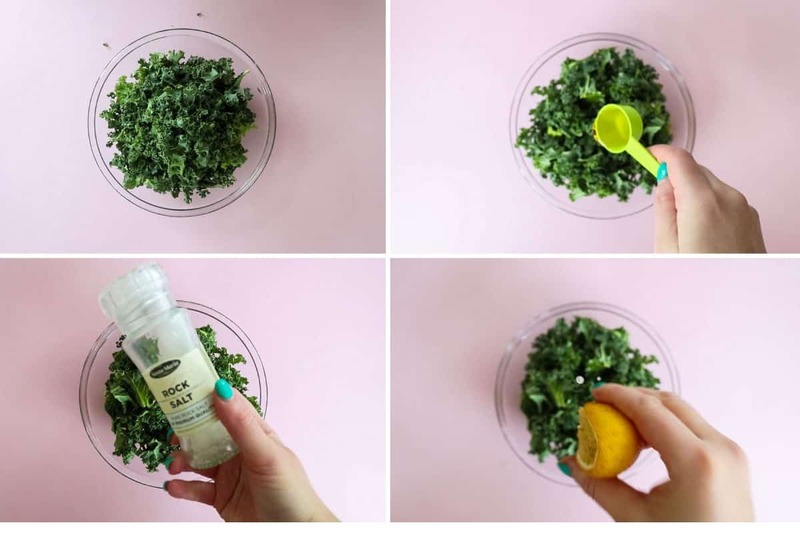 Then place all your Kale in a bowl and add olive oil, a pinch of salt and a squeeze of lemon. Mix well and massage your Kale for a few minutes. This breaks down the tough fibers of the kale and makes it a lot nicer to eat. Pour out onto an oven tray lined with baking paper and spread out evenly. Bake in the oven at 150 C / 300 F for 15-20 minutes. Check after 15 minutes to ensure they’re not burning, and leave for another five if they need a bit more crisp. Take out from the oven and set aside to cool down & get the final crisp. 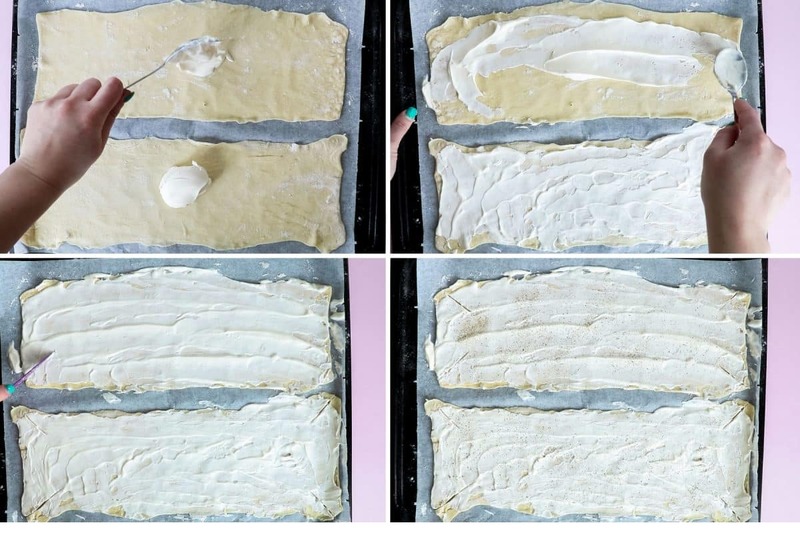 Meanwhile, make your puff pastry pizzas! 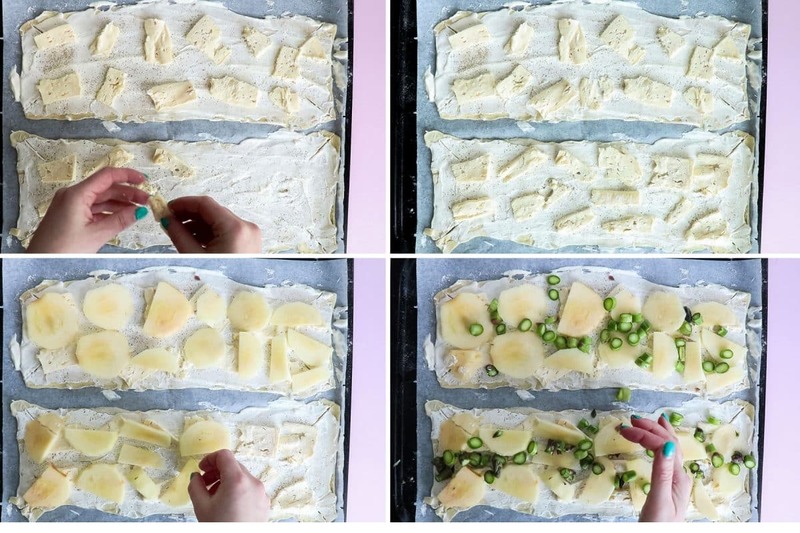 Start by bringing out your frozen puff pastry and let it thaw until soft. This takes about 15 minutes, if you turn it once or twice. 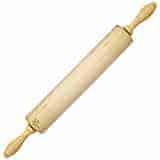 Once thawed, roll it out as thin as possible with a rolling pin and place on an oven tray lined with baking paper. Then start with the first layer – the crème fraîche. Scoop out one heaping tablespoon of crème fraîche on each piece of puff pastry and spread it out evenly. Cut a notch in each corner of the puff pastry – this helps make the pizza turn out nice and not too puffed up. Then season with fresh ground black pepper. Now add the sliced cheese evenly, and follow with apple slices and chopped asparagus. When you’re satisfied with your toppings (the kale chips will be added later! ), bake your pizzas in the oven at 225 C / 440 F for 15 minutes. When your pizzas are beautifully golden brown, remove from the oven and bring out your kale chips. Grab a handful, and crush them up sightly while spreading out over the pizzas. And now you’re ready to serve! This puff pastry pizza is a yummy indulgent lunch or dinner – and each pizza will feed one very hungry person. More commonly though, I serve puff pastry pizza as an appetizer or as part of a buffet or tapas spread. Each pizza makes 6 good-sized pieces so as an appetizer or as part of a larger spread, one pizza will be enough for 3-6 people. Not sure what to pair it with? Well if you ask me, it goes wonderfully well with my good old favorites Feta Stuffed Dates and Bacon Wrapped Dates. But I sure wouldn’t mind it as a starter for a Shrimp Risotto either! 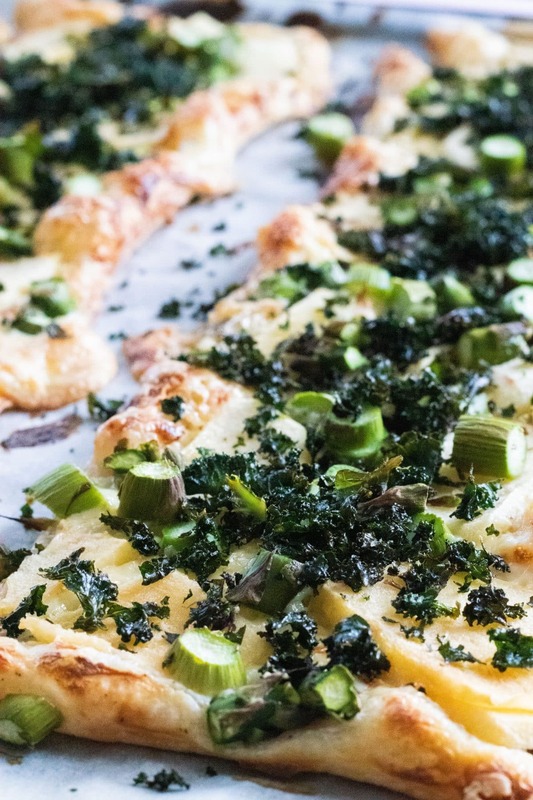 Have you made puff pastry pizza before? Or maybe you’ll make it now? Let me know in the comments below! 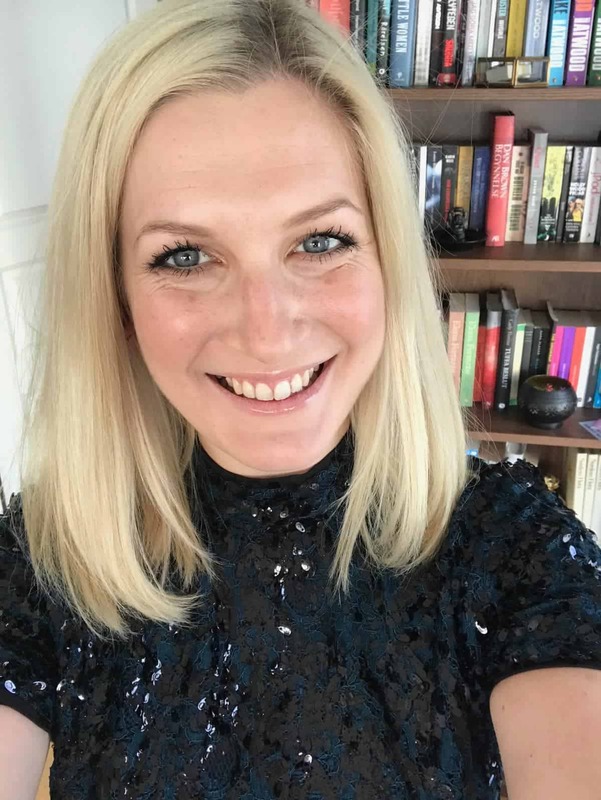 And while you’re at it – if you leave a review as well you’ll really make my day! Set the oven for 150 C/300 F and then start by preparing your kale by removing the stems (if any) and dividing the leaves into maller pieces. Place in a bowl. 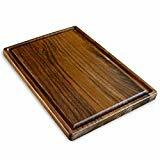 Prepare an oven tray by lining it with a baking sheet. Add olive oil, a pinch of salt and a squeeze of lemon to the kale and mix. 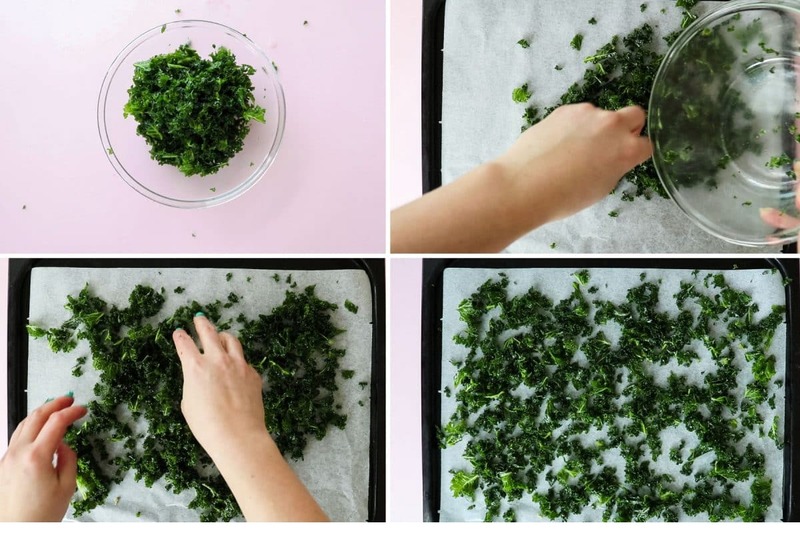 Massage your kale for a few minutes and then spread it out on the baking sheet. Bake in the oven for 15-20 minutes, checking once after 15 minutes to ensure they’re not burning. When done, take out and set aside to cool down and crisp up. Raise the temperature to 225C/440 F for the pizza. 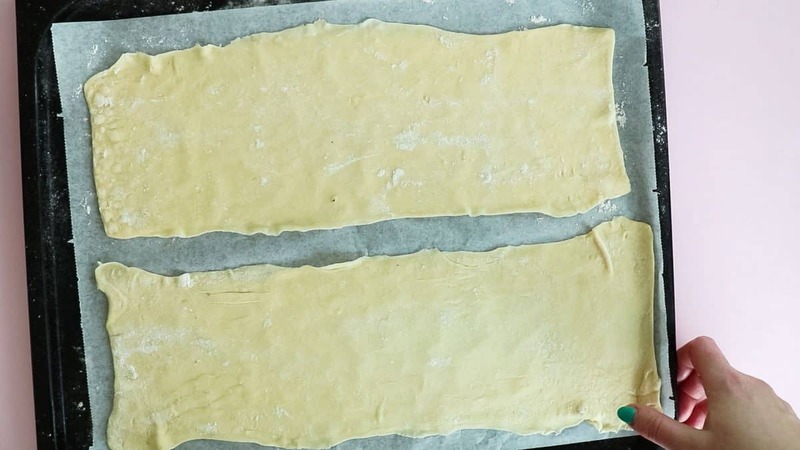 Line another oven tray with a baking sheet and roll out your puff pastry as thing as possible. Place it on the baking sheet. Add one heaping tablespoon of crème fraîche to each piece of puff pastry and spread out evenly. Cut a notch in each corner to ensure your pizza doesn’t get too puffed up. Then season with fresh ground black pepper. Add the blue cheese slices, apple slices and top with chopped asparagus. Ensure that the oven is at 225 C/440 F and bake your pizza in the oven for 15 minutes, until beautifully golden brown. 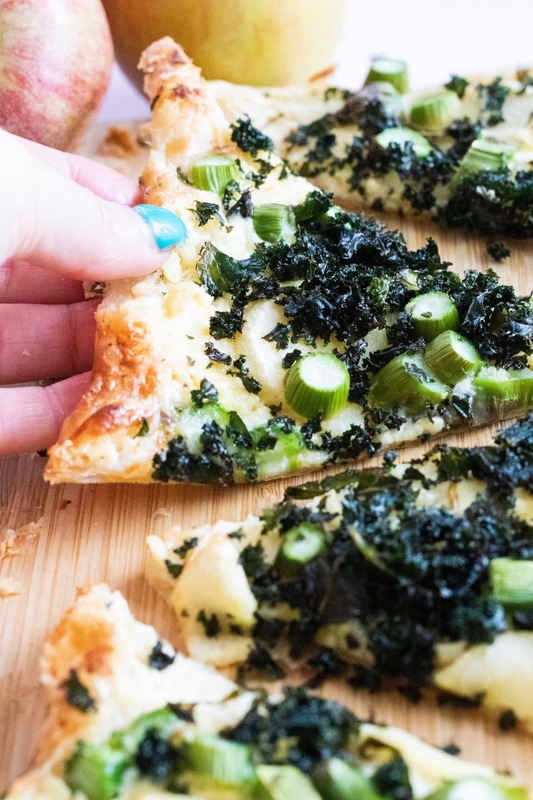 When done, take out the pizza and bring out your Kale chips. Grabbing a handful at a time, crush them up slightly in your hand while topping your pizza with them. And now you’re ready to serve! Make Perfect Pizza at Home! What a great recipe, I will definitely have to try this out at home. It doesn’t look too hard, thanks for sharing. Believe in yourself Ritu! I bet yours will turn out amazing! i love how yummy and healthy this sounds! I’m definitely going to have to save this and try it with my family! I know it’ll be a hit! Wow that doesn’t look easy. Do like puff pastry. This would be fun for build your own sleep over parties. MMMMMM I want to make this ASAP!! it looks amazing! I’ve never tried kale, but this sounds so yummy! i have all the ingredients in my kitchen and yes this is what I’m having for BRUNCHHHHHH!!! YAAAZZSZ! thanks for sharing! LOVE your comment!Thank you Jessa! Hope it turned out amazing! seriously puff pastry is just the best thing ever. 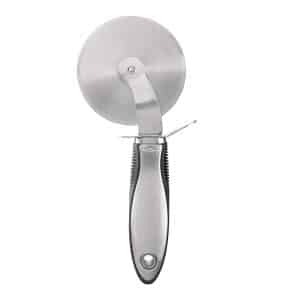 i feel like a master chef every time i use it LOL! this sounds delicious, especially with the blue cheese. Haha same here! Like I reinvented the wheel or something 😉 Thanks for commenting Danielle! Wow, it looks so yummy. Thank for the detailed recipe. 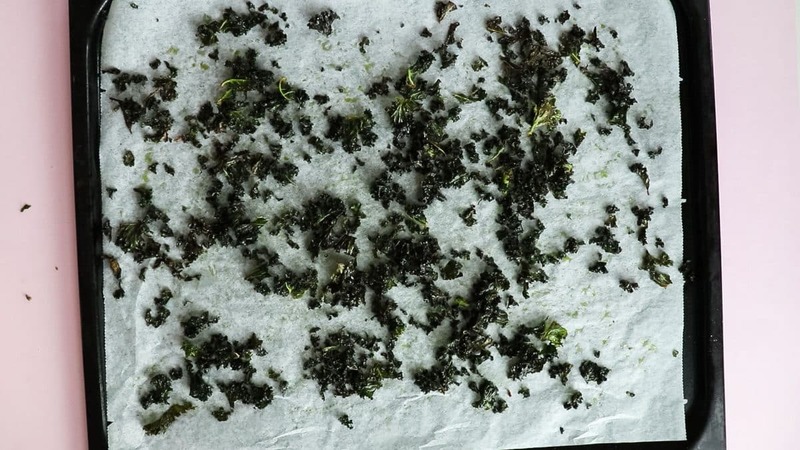 Didn’t know that you can use kale chips this way. Thanks, definitely gonna try. Me neither but then I thought “why the —- not??”. Thanks for commenting & rating! Oh wow this looks so nice! Thank you for sharing! 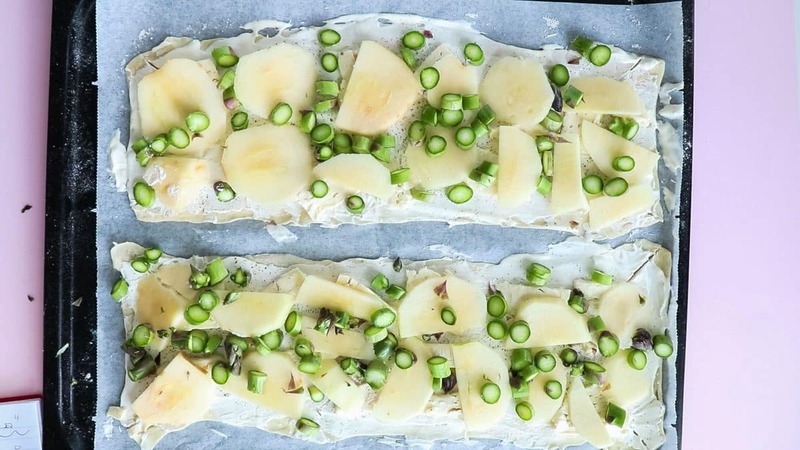 So quick & easy – and best of all, you can always have some puff pastry in the freezer! 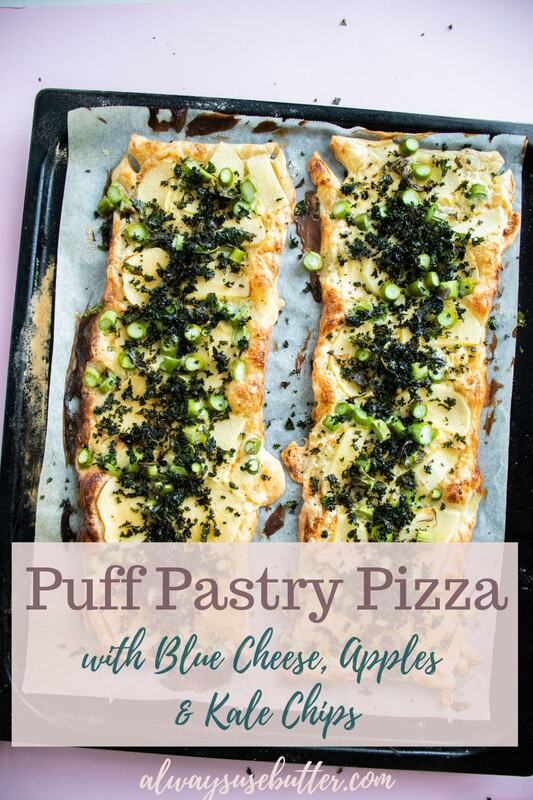 This Puff Pastry Pizza with blue cheese looks really good, I wanna grab it right now. A great recipe I would love to try. I always have your recipes written down in my recipe book. Love this Lydia! Thank you! 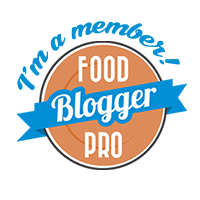 I love your easy and useful tips to prepare this pizza. Great job. Thank you so much Kaylan! That pizza looks delicious! I’ve never had apples or asparagus on pizza before. I’ll have to try it out soon! Oh my goodness. I can’t wait to try this recipe out . It seems so easy to make. Yum! That looks wonderfully easy and tasty. This was super helpful in making me feel more knowledgeable about it. I love pizza. The pictures alone sealed the deal for me. This looks and sounds incredibly tasty. 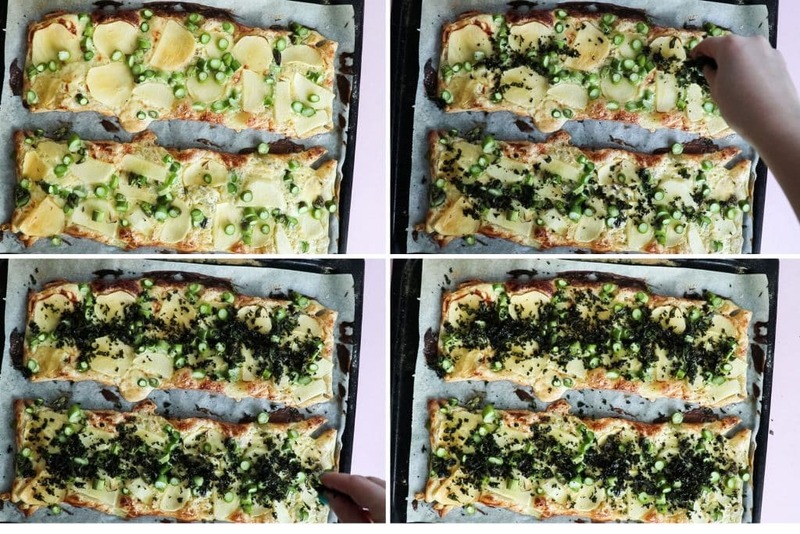 Puff pastry AND pizza?! I can’t wait to try this! Drooling over the idea of this! Yum- this looks good! 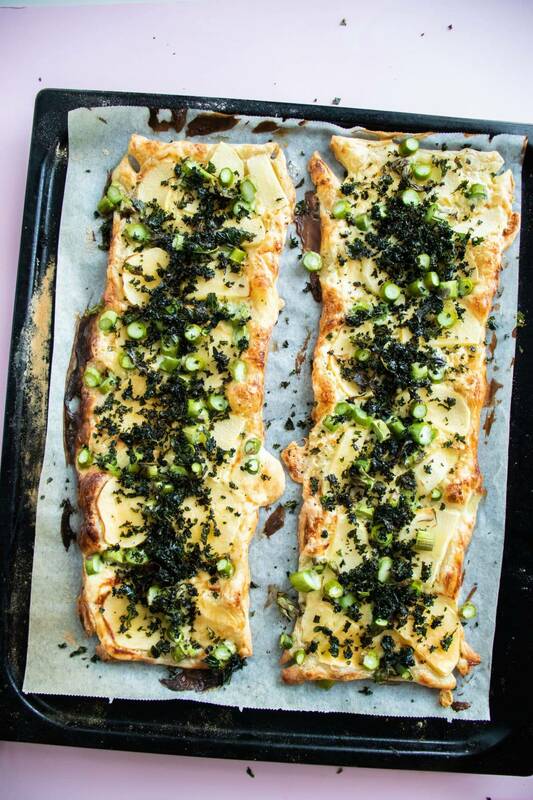 Puff pastry can do no wrong. IT’s good with everything! I so need to make a pizza this weekend. I am sharing this recipe with my partner, we will try out this weekend. I love the combo of fruit and blue cheese. This looks so simple and delicious! Perfect for a Mother’s Day spread! 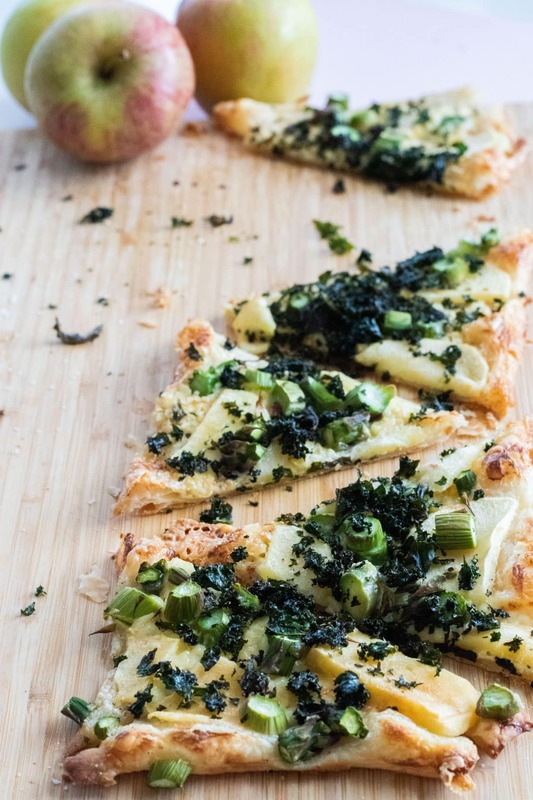 This is such a quick to make recipe and love the crisp kale in the recipe. 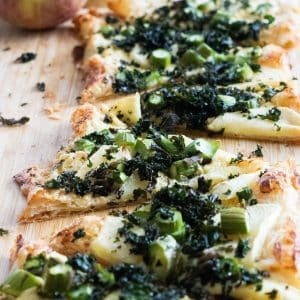 The blue cheese and kale together on the puff pastry is a great combination and using store bought pastry sheets makes it so quick. I don’t like blue cheese but this looks good. Would probably be awesome with any other kind of cheese as well – like a brie or something! I love adding blue cheese to my pizza. I have been doing it for quite some time now and thought I was the only one. Duh! Fantastic recipe that goes straight to the top of my favorites! Weell, great minds think alike, April! 😉 Thanks for commenting! Wow, I never even imagined these two combined. I love it! I love making new recipe ideas for kale.